TC: Could you tell us something about your background? MH: I did my degree in history at the University of Bristol and got my first job as a research assistant in the Imperial War Museum. Military history had been a speciality of mine. From the Imperial War Museum I moved to the Horniman and eventually became its director. In fact there’s an Irish connection with the Horniman because Annie Horniman was involved in setting up the Abbey Theatre. TC: Did you grow up with an awareness of an Irish background? MH: Yes, very much so. My father was born in what is now the Republic when it was still part of the British Empire. My grandfather came to live in Liverpool in the 1920s and my father came over on the outbreak of the Second World War. I have been very much aware of what might be described as the oral tradition. My father talked a lot about Irish history. TC: What attracted you to the post of Director of the National Museums and Galleries of Northern Ireland? MH: I thought it was probably the most challenging museum job in Europe. I have always been lucky to be in posts which presented an intellectual challenge. In the case of the Horniman, what was a local authority museum became, with the abolition of the Greater London Council, an independent charitable trust running its own business. So we had lobbying to do, then setting ourselves up, structuring the organisation to operate in an independent manner. I have got used to a situation where I have never actually had a baby-sitting job. Clearly anybody who saw the advert and knew anything about Northern Ireland museums—just the fact that there was a merger—would know that this was not a baby-sitting job but a serious challenge. TC: How aware were you of the place that ‘history’ has in Northern Ireland—often itself disputed and a weapon in political argument? MH: I was aware of the importance of history, partly because of my own father. He was one of these people who remembered a huge number of facts, dates, with incredible accuracy. So I was aware of the importance of history, but having come here I realise even more so that it is a big subject and that it pervades everything. It gives a flavour to museums. For example, in my previous museum we had natural history collections, ethnography collections. The scientists there would say that natural history was a subject which had to be dealt with separately. In the NMGNI there are scientific collections but the scientists here very much see the role that people play, their influence on the environment in the context of science. And history is about people, so there is a recognition right at the most fundamental level that people are at the centre in terms of their history, their impact, their future. So it’s a people-centred institution as opposed to having science on the one side and people on the other. That inevitably places history right at the centre of the whole institution. If you look at the art collection, what is interesting about it is that in the Ulster Museum it is sitting alongside all these artefacts, these products of humanity, and it provides an essentially subjective view of life, society, experienced through the eyes of an individual artist. It is similar to the Imperial War Museum where the art is alongside tanks and shells adding a very human dimension. History runs through a lot of the collections and that raises the question to what extent are we serving history, and that in turn raises the question of whose history is it. One of the things about the 1798 exhibition is that it shows that the museum has the ability to deal with a very contentious subject even-handedly, or certainly in a way that both sides of the community can come here and not feel threatened or be aggravated but see an honest attempt to tell a story. So the museum is a sort of neutral ground where the community can actually come and look at history. TC: One of the characteristics of museums in Northern Ireland is that the senior staff tend to be ‘home grown’. Do you think that as an English professional you will bring a new perspective to these museums? MH: Obviously we are all products of our training and the environment we work in and we have to recognise that. So I come with a particular way of seeing things. What I am offering is a different dimension, another perspective. Something I valued working in the Imperial War Museum and the Horniman was the international context—the importance of international perspectives, the way in which national issues have to be seen quite frequently in an international context, and that we can learn through experience from all over the world. Part of the responsibility of museums is to tell the story of Northern Ireland, but I think there is also the responsibility to provide a window onto the world. Clearly we are not going to go out collecting international material willy-nilly but through touring exhibitions there is an opportunity to bring the world to Northern Ireland. The Ulster Museum’s art collection travels all over the world but there is a reluctance on the part of lenders to send material here so we do not get the major exhibitions. But if you look at Northern Ireland, or what would become Northern Ireland, a hundred years ago it was part of an international network of industry and commerce which included Europe and America. One of our museums deals with that issue, of people emigrating to America. And then if you look at the technology there are aspects which are very much international. However, one cannot underestimate the impact of the last thirty years in terms of turning Northern Ireland in on itself and it is only just beginning to open up. TC: Why the ‘National’ Museums and Galleries of Northern Ireland? MH: That is a very interesting question. It is a part of a larger process which has been gathering pace to identify certain ‘chunks’ of the UK as being somehow separate. In the case of the Welsh it is to recognise their own cultural identity; in the case of Scotland it is more politico-cultural. The Scottish cultural element is more nebulous; it is much more difficult to get hold of the cultural identity and the drive for separation, for separateness, is mainly political. Whereas with the Welsh there is a sense of ‘otherness’. This issue is bound up in the larger packaging of the margins of the British Isles. Certainly in the last thirty years there has been engendered within governments this sense that Northern Ireland is somehow separate. There is that strip of water which makes a big difference, but there is still that border that has been there for seventy odd years. There is a pragmatic recognition that the border exists and clearly Northern Ireland is separate and it has people regarded as Irish living in it. The other way of looking at it is that there is a collection here which has national and international importance in both the contexts of the UK and Ireland. It is recognised as having an international reputation. Also it is funded by a national government and so is in that sense national. The existence of the National Museums and Galleries of Merseyside does not mean that Merseyside is a nation but that the collections are of national and international significance, and that is what is meant here. TC: In parts of Belfast the Ulster Museum is still referred to as the ‘Protestant Museum’ while in others people say that it ignores their Loyalist working-class experience. Do you believe that this ought to be actively tackled? MH: Most certainly. Museums are often perceived as white middle-class centres of culture and entertainment. In the case of the Horniman Museum we found that we were not attracting an audience that was representative of the ethnic background of the area which we were in, and we addressed that very positively. One of our education officers was sent outside the museum. We had performance indicators in relation to attracting visitors from all parts of the community. Our researches uncovered, for example, that members of the Asian community did not visit museums. It was not part of their culture, whereas we found that West Africans in particular were quite good at visiting museums. As soon as we started targeting projects at them, with an exhibition of the Joroba people for example, they came in and worked with us, running workshops and so on. Then we changed our programme to include exhibitions on the Hindu villages which started to break into the Asian area. We need to do a similar exercise here and understand why museums are perceived as they are. But on the other hand I have to refer back to the example of 1798. We got very good feedback from both sides of the community. We had an outreach officer, Jane Leonard, working in the community, and she is now working on another project which is concerned with collecting the contemporary. There are two issues here—one particular to Northern Ireland and one common to museums everywhere. The question of ownership is one that effects all museums and is being addressed in interesting ways. In America, exhibitions on Native Americans are being curated by Native Americans. Efforts are being made to bring people in and give them a sense of ownership. It is down to our programmes. We will have to have programmes that are relevant. But there is the fundamental, socio-economic, problem that if we put on dinosaurs we get huge numbers while another exhibition will not attract the same numbers but may still address issues that we have to address. They may be history related. I would like to feel that people from both sides of the community will come here and feel a sense of ownership, that they have been consulted and that their voices are coming through in the exhibitions, that they will feel comfortable but more importantly that they will also have the opportunity to look at how other people live. TC: Do you think that a problem might be the ‘totemisation’ of history—the idea of a ‘Catholic’ history and a ‘Protestant’ one? Should the dinosaurs or an art exhibition which attracts huge numbers from across the community be seen as the norm and not aberrations? MH: There is always pressure on museums to find out what the people want. It is the classic problem that if you ask people what they would come to see, it might be dinosaurs this year; it was the Titanic last year. It is similar to television where if you ask people want they want they say Eastenders or Coronation Street, but that is no reason for Channel 4 or BBC 2 not to provide something different. There are certain things we should be doing regardless of popularity because they have an enduring value. Museums should not underestimate the fact that we can service schoolchildren, organised groups, and that there is a great opportunity to inform and to change people, though museums sometimes overestimate their power to change people. On the other hand there is the question of social capital. Museums can do things, build collections, that are of social benefit. There has been a lot of pressure on museums in relation to economic capital—entry charges, ‘pay your way’, etc.—which is right to some extent, but there is the bigger issue of social capital. In Northern Ireland and in many urban multi-cultural environments, museums have an important social role to play. That social capital is built upon trust—just as economic commerce is built to some extent on trust. That trust is what you are talking about; that both sides of the community can feel comfortable in the museum and on that basis you can start to build something else which is to do with knowledge and awareness. That in the long term is what we want to do. That is the social capital I mean and we are still at that stage of trying to build trust. TC: Is having three separate sites a problem, an opportunity or a challenge? MH: In a sense there are really four sites. The NMGNI is a fourth, ‘conceptual’ site. It can address the issue of intellectual direction which the individual sites on their own perhaps cannot do and fill in those elements of the picture which are currently missing. If you took all three sites in relation to history, you can get a very detailed picture of migration at a specific period at the Ulster American Folk Park; at the Ulster Museum you get vignettes of the historical story from the Bronze Age; and if you go to the Folk and Transport Museum you find a frozen picture of time in its exhibits (although it is currently addressing this issue). If you step back from all that and ask ‘What does all that tell us?’, what you have are some very deep insights but you have not got a contextualising picture. It is the responsibility of the NMGNI to address that fundamental gap. What is missing is the twentieth century. Being a historian I am still interested in stories and where is the line there? There is nothing to string those individual pictures together even in a loose way and that is needed. This refers back to the question of what is the ‘nation’ because we cannot just say ‘here is the history of Northern Ireland’. It is illogical to do that. You have to take the history of the island. Now our collections will not support a total history of the island. Once we get closer to the nineteenth and twentieth centuries, we can. But you have got to include the big picture. What we are talking about is a conceptual museum if you like! You can put different things into it like the Ulster American Folk Park or some of the other galleries but bind them together somehow whether in one place or by being linked with new technology, but conveying that history is the big challenge. Anybody who comes to Northern Ireland will want to know its story. In Edinburgh now they have a brand new museum which tells the history of Scotland. The United States has the Museum of American History. Here I can speak as an outsider coming to Northern Ireland. Living in England you only get a fragment of the picture through the media yet there are all sorts of interpretations, subtleties, caveats and lacunae that you are just not aware of looking from England. I’m talking more about modern issues but even so, if you do come to Northern Ireland you will want to know what has been going on and if the national museum will not tell that story, who will? TC: Do you envisage co-operation with similar institutions in the Republic? MH: There is a great deal of co-operation, particularly at the curatorial level and we would like to see that grow. Certainly if you want to take the broader view, it is desirable. In intellectual, cultural matters, the border is not a barrier. Music and art transcend borders. Our exhibition at the moment is about Irish art. So I’m in favour of co-operation. TC: When the new executive is in place having responsibility for museums, do you think a ‘hands-off’ approach will continue? MH: I think that will depend on the assembly. Assembly Members represent the local community and the local community’s view of what they want in cultural terms will sadly be seen in local terms. Now what the NMGNI have to do is say that there is a bigger story and it is important that it is told. National museums have the resources and the expertise to tell the big stories, and they are important. Now we are not just here for the ‘toffs’. We are here for the community and so we need to get in touch with them, in the language we use, the approaches we adopt, to say that there is the issue of local identity but there are also larger issues. What struck me is the definition of cultural diversity. I have been used to a definition which is based on a very wide variety of religious beliefs, languages and ethnicities. Cultural diversity here is in a sense bi-culturalism. I know there are other ethnic groups, like Bengalis or Chinese, but the big issue is bi-culturalism. But we have nevertheless a predominantly white, Christian society. Even in countries like New Zealand you have a definition of bi-culturalism based on race and creed in a broader sense. Getting to grips with that for people outside Northern Ireland is very important. TC: Do think then there is an obligation on museums to reflect these minority cultures? MH: I think there is a need to take a comparative approach because in some ways it highlights the similarities between the bi-cultural part of the community and the real diversity that exists within the incomer communities. Although the comparisons are very interesting, they are not seen as part of the diversity of Northern Ireland and I find that difficult to rationalise. These communities are forgotten in what is a very narrow view of cultural diversity. This also highlights the importance of an international perspective. It is very worthwhile to take a look at other situations, even the negative things, like what is happening in the Balkans, for example, where there are a lot of similarities, certainly in terms of what drives people. Also the broader view of how people rationalise and live together. I think it is a question of recognising the validity of the ways in which people live. There is great diversity but one must recognise that this is not a problem. TC: How would you like to see the NMGNI developing? MH: Ideally I would like the NMGNI to be about the future, that we could actually contribute towards building social trust, social capital. That we can use the collections in a way that enables people to think about the future, to provide some very basic simple insights, not necessarily lessons, just insights, into the world, the way in which people live, the tremendous diversities of people, of environments. So that we will be very much part of the living community, not just the mausoleum of ancient artefacts. Museums have contributed to the economic capital of communities. In Bilbao, Sydney, Boston or Barcelona museums or galleries have contributed to urban regeneration and are very much part of the community in that sense. I would like to see us as part of the regeneration, economic and social, of Northern Ireland, and to have that recognised by both the community and those responsible for taking decisions. 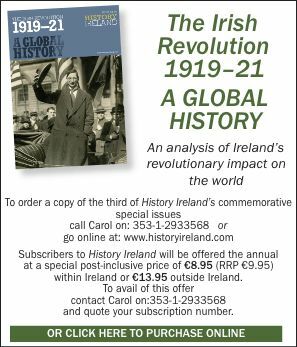 Tony Canavan is an editorial consultant and member of the editorial board of History Ireland.